Living easier with less stress and having more free time is what many of our members want and it’s what we help you with. Take cleaning off your checklist and do something that makes you and your family happier. Our members love coming home to a clean house and taking a moment to enjoy that feeling. We have no hidden fees, up charges, contracts or agreements that you find elsewhere. Amazon, Yelp, and Home Advisor rank us a 4.5-star cleaning company. It’s because our members love us, trust us, and refer us. They also know when we make a mistake we work to make it right. So we know we are doing a few things well. You wouldn’t let a criminal in your home and we would not either. We conduct criminal and background checks on all our maids. We also recheck for criminal activity throughout the year. Most companies only check once, if at all. We are a Local Houston Texas Cleaning Company and not a franchise. We cover all the Houston metro areas. All our revenue stays in Texas. 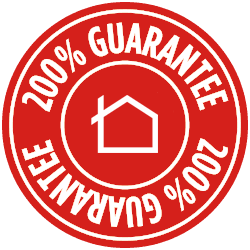 With our 200% raving customer guarantee, you won’t go wrong. So get a real price the first time, see what’s include and enjoy a safe and secure house cleaning experience. We have a 200% happiness guarantee because our members love our work. If you wouldn’t recommend our cleaning service to a friend then we have missed our goal. We’ll come back and redo the cleaning over of what me missed and if you are still not happy you will receive a refund. We put our money where our mouth is with a big ole Texan guarantee that you’ll love our home cleaning service! Our members are busy and we know this and have built our home cleaning service to save you time. There is not need to waste time with in home estimates, haggle or stress out about getting things right. Our online book platform is easy to book your home cleaning appointments on any mobile device. Just visit our booking page, plug in your address, time and date of service and you’re all set! No, really, It’s that easy. In less than one minute of your time your booking your home cleaning is off your to do list. Manage your cleaning appointments through our website or mobile apps freely after you have booked your service. We understand that finding a home cleaning team can be difficult. Unlike other services, all of our cleaning teams move through a strict hiring process. The process involves questionnaire, multiple phone interviews, in-person interview, in-person cleaning certifications, and a complete and thorough background check. We do this so that our members only get the most competent, trustworthy and thorough home cleaners. Ready Set Maids is fully bonded and insured. Your home and property will always be safe with us. Guided by our core values of integrity and quality means you will know if something goes wrong. Its rare we mess up but if we do it dealt with in an up front and honest way. We are committed to taking care of our members the best way possible. Our members have given us 5-stars across the web because of our core values. We are guided by our Texan values of integrity and quality. Bering honest with ones self is the most important thing to us. It is not about when people are look it is about the choices we make that no one will know about. If we damage an item in your home it will be replaced, repaired or you will be compensated for it. Quality is the overall experience we bring to our members experience. We do our best to show up on time, be professional, friendly and do a great and thorough job every-time. That’s why Ready Set Maids gives short arrival windows and sticks to them! If an unforeseen issue arises we will communicate with you as quickly as we know. If we happen to miss our quality mark, we will as part of our 200% happiness guarantee, work to make you happy. Why wait, book your first house cleaning today!